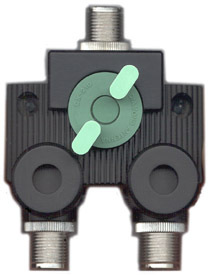 The Diamond CX-210N is a low loss, two position coaxial switch providing very low loss and high isolation. It is rated DC to 3000 MHz and can handle up to 1500 watts CW at HF frequencies. See Specifications below for complete power handing characteristics. This switch utilitizes N jacks for input and output.